Corona foundered with 154 aboard. Corona (#126522) (1888-1907), a 220.7-foot steam ship built in Philadelphia in 1888 for the Oregon Improvement Company. In 1897, she was sold to the Pacific Coast Steamship Company, and during the following year, she worked the Alaskan gold rush and was known as a “lucky ship.” According to an advertisement in a 1900 Santa Barbara Daily Press, her regular run from San Diego to San Francisco stopped in Port Los Angeles, Redondo, Santa Barbara, and Port Harford. According to Santa Cruz Island Company invoices, Corona serviced Santa Cruz Island between 1891 and 1897. 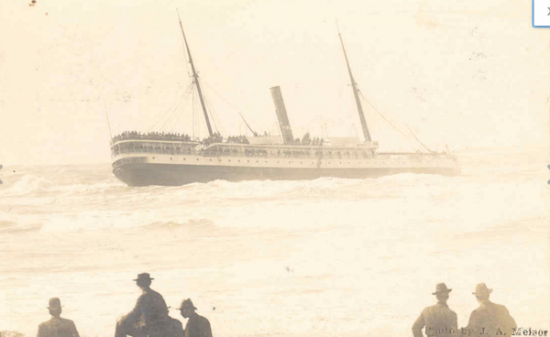 Her luck ran out, however, March 1, 1907 when she was wrecked on a jetty near Eureka, California. There were 154 aboard at the time of the accident, and one life was lost. The Pacific Coast Steamship Company was unable to salvage her. This page was last edited on 25 January 2019, at 08:10.